The complete first trilogy. 3 books. 1,100 pages. Over 80,000 copies downloaded. On the cut-throat streets of Tarkis, orphaned teens like Rath end up jailed … or dead. So when the shadowy Janus Group offers Rath a chance to earn riches beyond his wildest dreams, he seizes it. But the Janus Group is as ruthless as the elite assassins it controls. Rath will have to survive their grueling, off-world training, and fulfill all fifty kills in his contract before a single cent comes his way. And ending so many lives comes with a price Rath can't anticipate. It'll certainly cost him what's left of his innocence. It may well cost him his life. Rath just assassinated a senator, and completed his final mission for the Janus Group. Now every Interstellar Police officer on Alberon is searching for him. If they don't find him, one of his fellow contractors certainly will … and the most feared criminal organization in the galaxy has severe punishments for employees who break the rules. Rath's only hope is to find the rogue contractor who helped him escape a company deathtrap after his final mission. United, the two assassins might just get free from the Janus Group and get what they're owed. But first they'll need to survive. 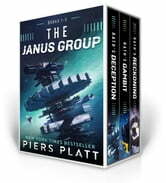 Rath and Paisen completed all fifty kills in their contracts with the Janus Group. But when they uncovered the criminal organization's darkest secret, the Janus Group unleashed an army of assassins to silence the rogue pair. With help from a former Interstellar Police detective, Rath and Paisen survive - barely. Their plan to attack the Janus Group head-on may be suicide, but in the end, they'll tear the organization to the ground … or die trying. These being the first three books are a great beginning of what holds out the promise of being a marvelous fantasy of a quest towards one man's redemption through fire. The story of an assassin with a conscience and a penchant for fairness. Good book interesting story line. Hard to put down at times.